The NBL finals were run in very poor conditions to run decent times this year. Because of that when the first draft of the NCS Redwood Area meet heats came out all five of the NBL qualifiers where listed in the slow heat. Now you can still qualify for the MOC meet from that heat but it’s a heck of a lot tougher than running against the top runners in the faster heat. Luckily for our crew a number of runners from other leagues started scratching and by the time of the meet 4 of our 5 moved up into the final 4 spots of the fast heat. This put them with Redwood junior Liam Anderson one of the top distance runners in the nation. When you watch the race below you will see him go right to the front, control the pace (64, 70, 67), and fairly easily hold everyone of with a 60 second last lap. His 4:21.16 time was probably well within what he could have done. This year he has run 4:12.15 4th in the state and 8:52.74 3200m 1st in CA. But it’s really our guys I want to talk about. 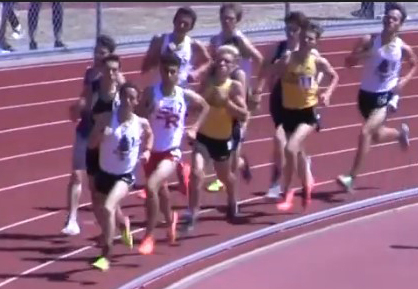 First there was Petaluma’s Jack Dunbar who pressed Anderson all the way to the finish line with his season best of 4:21.58 leading a mass finish that had ten runners all within 2.11 seconds of Anderson. Only the top seven could be assured a trip to MOC. After Dunbar came two other runners followed by the NBL sophomore Colton Swinth from Maria Carrillo in a PR 4:22.04. NBL champion Lucas Chung was a whisker behind in 4:22.06 for 6th. Carrillo sophomore Pierce Kapustka was just out of the money for the free trip to MOC but his 4:22.32 PR was so fast that he and two boys after him get to go on as they all beat the 4:24.16 automatic qualifying time. Also amazing is the only two of the top nine are seniors. Look out 2019 race. Did I mention that Swinth and Kapustka are only sophomore’s. Two of the best we have ever had. Check out the list below. 4:22.37 Steve Guerrini, Santa Rosa 1989     3rd at state 4:13.85 1991. Now watch the race as provided by Griffin Epstein from Trojan Live a Petaluma High student-run TV Station.